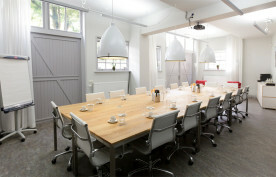 Event space for business occasions? 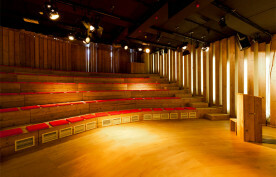 Are you looking for a space for a meeting, presentation, staff party or anniversary? 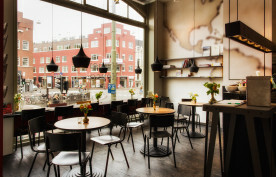 On a well-accessible, historical location in the center of The Hague? 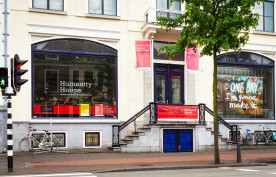 Then book an event space at the Humanity House. 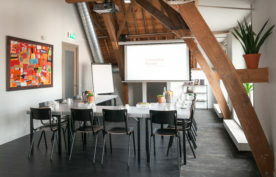 Organize your meetings, training sessions or events in one of the special areas in the Humanity House. Behind the Humanity House lies the distinctive Coach House, containing The Hague room. Suitable for groups of up to 20 people. The theatre, seating area and accompanying foyer of the Geneva room are multipurpose spaces that can accommodate groups of up to 100 people. On the top floor of the magnificent building, the New York room offers a view of The Hague. Suitable for groups of up to 30 people. The Nairobi Room is an inspiring space with a ceiling full of beautiful ornaments and plenty of daylight thanks to its large windows. This multifunctional room can accommodate up to 30 people. The Vienna Room is at the top floor of our monumental building. 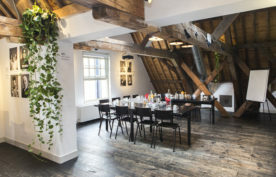 It has a stunning view on the 'Grote Kerk' and the other historical buildings at the Prinsegracht. A suitable place for informal gatherings, also available in combination with the The Hague room, New York room and Genève room.